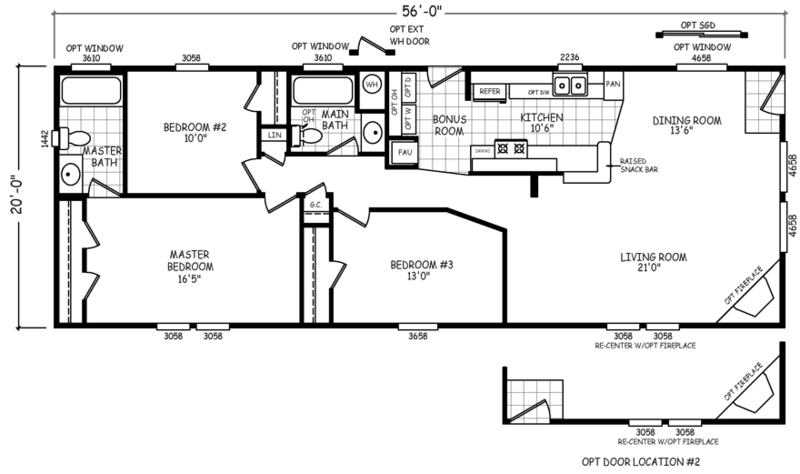 The Silver Cliff model has 3 Beds and 2 Baths. This 1120 square foot Double Wide home is available for delivery in Arizona, California, Nevada, New Mexico, Colorado, Utah. The living room of the well-proportioned Silver Cliff model would make a fantastic gathering spot for game night or celebration of any size! Large enough to accommodate a pool table, or a full-blown entertainment center, this is the type of room where families gather to forge fond memories. You could also re-center your space and add an elegant fireplace. If pictures are shown, they may depict upgrades and options that are not included within the base price of the home. Ask your housing consultant for details about the other great features that come standard on the Silver Cliff manufactured home.